I love the holiday season. When I was growing up I loved decorating, baking, cooking and gift giving, but most of all I loved wrapping. Everyone I knew would bring me gifts to wrap and I would spend hours on the living room floor wrapping them, coordinating ribbons and forming bows and ringlets to create a beautiful little package. Now that I live thousands of miles away from the place I grew up, my mama, my sister, my niece and my best friends, the best part of the holidays is going home for a visit and spending time with loved ones. We’re heading to Canada for a couple of weeks, and as usual, we’ll be enjoying the VIP treatment from my mama which I’m really looking forward to. She’s already baked up several dozens of her Lebanese Christmas cookies, aka. Ma’amoul, which she’s created healthier vegan versions of. I’m especially looking forward to the Ajwe, the date filled variety, but oh, then there’s the pistachio filled version and the walnut filled version, I’m going to need someone to hold me back. I usually bring a small selection of her baked goods to holiday gatherings and everyone goes wild for them. This year, I wanted to create a recipe that would be easy to whip up without a lot of fuss so I could add a personal touch to my host/hostess gift. So, I decided on Fruit & Nut Truffles, inspired by “visions of Sugar Plums dancing in their heads”. Traditional Sugarplums are made with a combination of dried fruits, nuts and spices and formed into little bite size candies or truffles. There are two varieties here, the first is made of dates, hazelnuts and pure cacao powder and the second is made with cranberries, cashews, coconuts and coconut butter. Both are free of added sugars, they’re rich and creamy, and reminiscent in texture of a chocolate truffle. They are also super quick and easy to whip up in, literally, minutes. I would suggest you make them in advance, refrigerate them overnight and serve them cold, but they taste equally delicious even if they’ve been sitting out for a while. 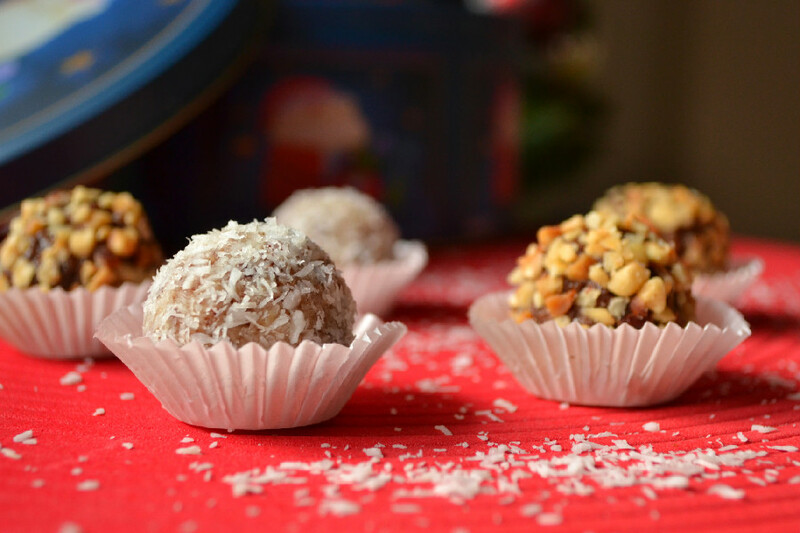 If you’re looking for similar ideas, you could also try these Apple Butter Protein Bites or these Date & Walnut Snowballs and make a whole collection for your next holiday gathering. Combine first 4 ingredients in a food processor and process until well combined and thick and compact paste is formed. Divide the paste into 10-12 equal pieces, roll into balls using the palm of your slightly damp hands and cover in crushed toasted hazelnuts. Keep refrigerated and serve cold for best results. Combine first 5 ingredients in a food processor and process until well combined and a thick and compact paste is formed. Divide the paste into 10-12 equal pieces, roll into balls using the palm of your slightly damp hands and cover in unsweetened dessicated shredded coconut.